For many people, the desktop is simply the place where shortcuts and icons are located, without any real functionality. 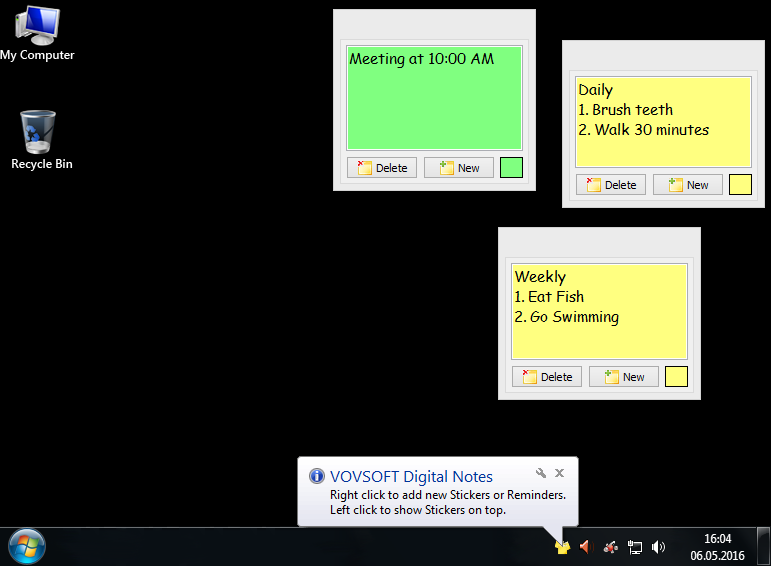 Nonetheless, you can benefit from all the empty space on your desktop by adding post-its, and Digital Notes is one of the apps that can help you do that. Once you install it on your PC, the application automatically goes to the system tray, and you can right-click its icon when you want to create a new note. It basically opens a resizable window where you can paste text or start typing some of your important tasks. Another handy function of Digital Notes is that you can create reminders to be displayed. You only need to choose the frequency interval, and then enter an appropriate message. I really don’t understand the need for this kind of software!! The function ‘Sticky Notes’ is already in windows 10, and also in win 7, so why should I use 3rd party software to add this function?